The Molong museum is housed in a delightful of stone building on the corner of Riddell & Gidley Streets and was built in 1860 as an hotel. It was then called “The Golden Fleece”. It is known that a rubble mason and also his son lived in Molong at that time and were responsible for several other stone buildings in the town. The building has had a chequered life as after being a hotel it later became home and surgery for several doctors over many years. Some of the old surgical instruments of one doctor, Doctor Andrew Ross, are in the Museum’s collection. 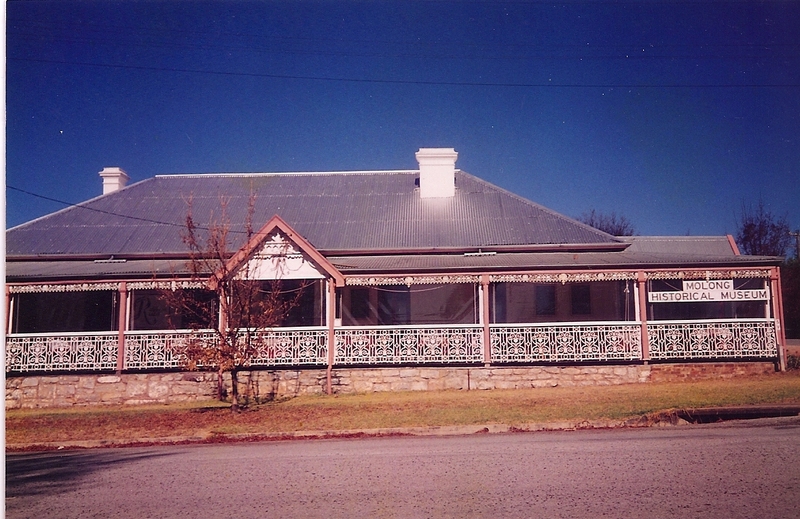 After the doctors exit from there it was turned into flats by the then owners and was this way for many years and in time was sold to the Molong historical Society for the rates owing. The building is large and accommodating and in 2009 received a Federal Government Jobs Funding Grant of $89.000 which was used to repair and refurbish the building using local tradespeople. During this time everything needed to be packed up and then replaced. It is still said that we have a “work in progress” as there are still repairs needed but from the structural work carried out it is hoped that it will be sound for many years to come. Apart from the building itself and displays the one attracting the most interest is the Fairbridge Room. Fairbridge was farm and home for children from the United Kingdom from the early 1930’s until 1975 and was located approximately 5 kms on the Mitchell Highway towards Orange. Research was done by interviewing old identities from Fairbridge and older Molong people who remember the farm and school as a thriving little community. One of the interesting questions asked, by people in the know is, “have you ever seen the ghost”?- No we haven’t but several members have had some strange experiences so on leaving the building at lockup time we usually talk it “her” and say goodnight. There is a lovely atmosphere throughout the building so we think “she” is happy and content as “she” can see we all over the building and care for it.